Discover today announced it has partnered with the soon to be IPO'd social game developer, Zynga, to help launch the first-ever brand-sponsored FarmVille expansion. The new, customizable holiday farm called Winter Wonderland is the latest partnership for Zynga, which in the past has teamed up to promote artists and films with in-game environments with Lady Gaga (FarmVille), DreamWorks Animation (CityVille) and Enrique Iglesias (CityVille). Starting tonight, FarmVille players can get an early start on a quest to help a friendly orange Yeti use his Discover card to do his holiday shopping, according to the company. Beginning tomorrow, players can get an exclusive three-day sneak peek of the new Winter Wonderland holiday destination by visiting Discover's farm within the game. Once in FarmVille, players can click on the Discover icon located in their neighbor bar to get an exclusive sneak peek of Winter Wonderland, before it is widely available to all players. 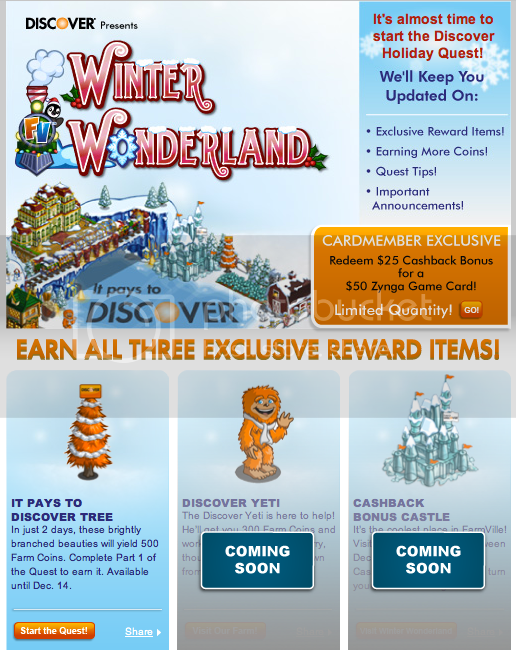 Additionally, when Winter Wonderland becomes available to the public on December 5, players will be rewarded with a free virtual gift from Discover for visiting Zynga's latest creation. Through December 14, FarmVille players can earn up to three Discover-branded farm items for completing different tasks along their Winter Wonderland journey. By becoming a fan of Discover on Facebook, players will get up-to-the-minute details on how to unlock these items along with access to exclusive tips to help them complete the Discover holiday shopping quest. "Social games bring people together into virtual communities. They're captivating increasingly larger online audiences that include many of our Discover cardmembers," said Mike Boush, vice president of e-business at Discover. "Partnering with Zynga to develop a unique in-game experience helps us connect and engage with players and put more fun in time spent online." During Discover's two-week FarmVille Winter Wonderland sponsorship, existing cardmembers can participate in a Hot Deal promotion that allows them to double the value of their Cashback Bonus(R) rewards on virtual game currency for most Zynga games. This means they can turn $25 in Cashback Bonus into a $50 Zynga Game Card, while supplies last. Non-cardmembers who apply and are approved for a Discover More card through a special link on the company's Facebook page can also receive a $100 Zynga Game Card after making their first purchase with their Discover card. "This is the first time a brand has helped bring an expansion to our players," said Ryan Linton, senior director of business development at Zynga. "Discover is bringing our players what they love, and they're giving them a sneak peek of Winter Wonderland to boot. We love that they're partnering with us to help bring a little extra holiday cheer."